*fear of anything falsely representing a sentient being, including ventriloquist dummies. Dead of Night is a horror anthology movie featuring five short tales, ending with "The Ventriloquist's Dummy," which may be the ur-example of creepy ventriloquist films. It's got the classics: uncertainty over whether the dummy is real or not; a possibly unhinged ventriloquist; a really creepy looking doll. Hugo causes his owner, Maxwell, to shoot another ventriloquist, Sylvester. Hugo tries to get a new job with Sylvester, which angers Maxwell enough to slap the dummy across the face. And then when Hugo disappears (apparently under his own power), Maxwell attacks Sylvester. Moral of the story is: If you get jealous and try to stop your dummy from leaving you, you'll end up in an insane asylum. To be clear, Devil Doll isn't a great movie. But it's not nearly as bad as most of the others that have appeared on Mystery Science Theater 3000. Despite apparently lifting the name for the dummy from Dead of Night, Devil Doll is one of the few ventriloquist stories where the doll is unequivocally alive. Well, sort of. It's the trapped soul of the assistant murdered by the ventriloquist. Who also wants to do the same thing to an heiress. So the dummy has to stop him. His solution involves soul switching, which doesn't really seem that much better than what the ventriloquist was doing in the first place. Anthony Hopkins is determined to haunt people's nightmares in any way possible. If Hannibal Lecter doesn't scare you, Fats will. In Magic, Hopkins plays magician/ventriloquist Corky and the dummy Fats. Fats convinces Corky to kill his manager and Fats stabs Corky's lover's husband. Then, because sometimes dolls get jealous, Fats tries to get Corky to kill his lover. Ventriloquists and their possibly real dummies have some serious co-dependency problems. Jerry just wants to get away from his dummy, Willie. While his agent thinks he's having a breakdown, Jerry knows Willie's talking on his own and that he's at the doll's mercy. So he creates a new act with "Goofy Goggles" and locks Willie away in a trunk. This does not please Willie. Not to psychoanalyze an inanimate object, but like Fats and Maxwell, there may be some jealousy at work here, as Willie tricks Jerry into destroying Goofy Goggles. And delivers unto Jerry a horrific punishment. Maybe. No, the photo isn't a mistake. That doll was so creepy, The Twilight Zone used it as a villain twice. This time, the dummy is "playing" Little Caesar, who is owned by Jonathan West, a ventriloquist so bad a little girl makes fun of him. So Caesar talks Jonathan into a life of crime, they get overheard by the little girl, and she tips off the police. They are, unsurprisingly, unmoved by Jonathan's attempts to get Caesar to confess. Jonathan goes to jail, and Caesar tells the little girl to kill the landlady with poison darts. Sometimes, all a weakling needs to become a villain is a mastermind to tell him what to do. Sometimes, that mastermind is an evil ventriloquist's dummy. When separated from Scarface, Arnold Wesker is quiet and unassuming, since he sees the dummy as the criminal mastermind who "forces" him into the life of a crime boss. Scarface has two important weaknesses: 1) he can't say the letter 'B,' leading him to call his nemesis "Gatman" 2) he and Arnold can get distracted by arguing with one another. A couple of things will pretty much ensure that a dummy will be evil: if the wood it's made out of is cursed, and if someone was dumb enough to put a soul into it. Slappy was made of the wood from a coffin, and sorcerer transferred his soul into it when he died. This is not a happy dummy. The good news is that he doesn't want to kill. The bad news is that he does want to enslave. And he's going to be rude about it. What else would a Chinese magician in Victorian London do with a cyborg from the future but use it as a ventriloquist dummy? Well, pretty much anything else, but Li H'sen Chang chose ventriloquism. Mr. Sin has a slight defect in that he really likes to stab people. This wasn't even the worst choice people make in this story: Chang's master, escaped 51st century war criminal Magnus Greel, gives Mr. Sin a laser rifle. Mr. Sin is even less discriminate with the rifle than he was with the knife. Henrietta has a simple plan: destroy the patriarchy by replacing male CEOs with their female secretaries. One of her victims is J.J. Hooter, played by Christopher Benjamin, who was also in "The Talons of Weng-Chiang." Apparently, he has "creepy dolls" in his contract. Henrietta, with her husband, recruits competent women, gives them charm bracelets that kill, and orders the death of men in power. And she runs a fitness center. Because of course a ventriloquist dummy runs a fitness center. Her husband's name is Henry, which pretty much ruins any attempt at a twist ending. When Vlad the Impaler and his lover, Elizabeth Rousset, died, their blood seeped into the wood of their beloved puppets and trapped their souls in them for eternity. (People, stop putting souls into dolls!) While Lizzie was tracked down and sealed away, Vladdy was bought and sold repeatedly, leaving a trail "frought with madness, fever, pestilence, matri-, fratri-, patri-, and sui-cide" in his wake. The dolls can possess people, and they want to marry while on the arms of two people in love. This will both restore them to human bodies and unleash an eternal night of blood. 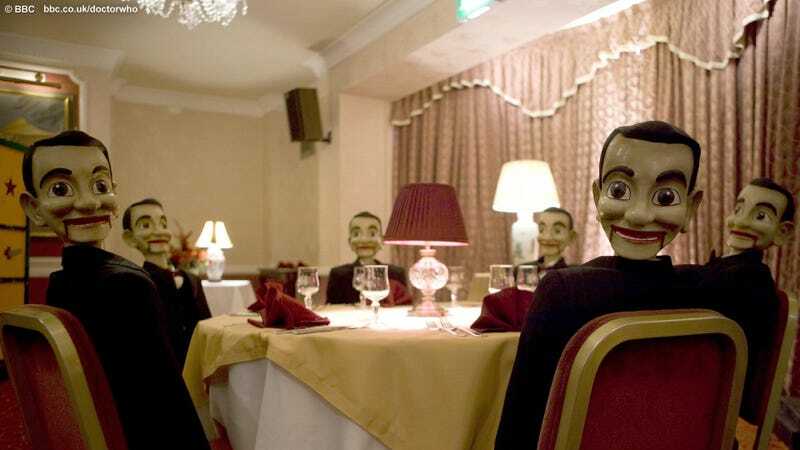 Top image from the Doctor Who episode "The God Complex."